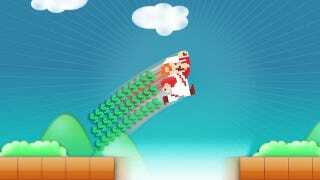 "Just think of paying 99 cents just to get Mario to jump a little higher." No. Let's not think of that. Ever. "We believe Nintendo can create very profitable games based on in-game revenue models with the right development team." "The same people who spent hours playing Super Mario, Donkey Kong, and Legend of Zelda as children are now a demographic whose engagement on the smartphone is valued by the market at well over $100 billion." This kind of talk isn't new. Fischer, like lots of other people obsessed with the company's current problems, dreams of the money that the embattled game company could make by spreading out their franchise into other ecosystems. But there have been very good rebuttals to that line of thinking. For now, Satoru Iwata and the powers-that-be in the House of Mario believe that their iconic plumber's best possible home is on hardware that Nintendo makes. Let's be grateful for that. And, if Mr. Fischer wants to a character that jumps higher, maybe he should play as Mario's brother, who already jumps higher. It is the Year of Luigi, after all. Top image originally via Ayay, dollar signs added by Kotaku's Chris Person.